Second Ferment: Ontario Wines: What's Not to Love? 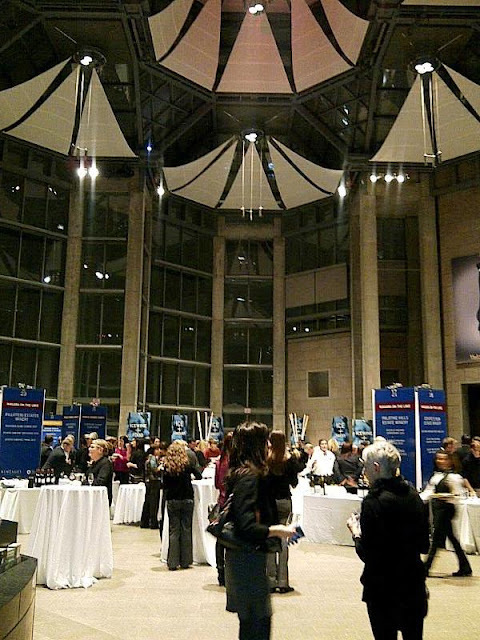 Ontario Wines: What's Not to Love? This week was like a big ol' love-in for Ontario wines. The interweb was all a-Twitter Wednesday night with #ONwinechat (sandwiched between #winechat at 9 pm and #BCwinechat at 11pm. That's a whole lotta tweets.) Shawn McCormick, of Uncork Ontario, re-launched the temporarily defunct online discussion to much acclaim last week. This Wednesday's subject: why don't more people buy Ontario wines? Earlier in the week, at the gracious invite of Wine Country Ontario, I spent an evening sipping on some top-notch products from across the province. Held at the National Gallery of Canada in the soaring space of the main hall, Taste!Ontario was dressed up like a classy gala but had the feel of a small-town house party with a bunch of good friends hanging out together. This was the place for storytelling. Like the tale behind Foreign Affair's Meeting of the Minds, a cab sauv-merlot appassimento blend. For a couple years now, a group of wine aficionados had been meeting at the winery to sample and discuss the wines, and to immerse themselves in the winemaking process, from harvest to bottling. Len Crispino, Foreign Affair's proprietor, described them as seeking a means of escape from their hectic schedules, big-city living and demanding careers, along with a chance to share their common passion for wine. At one point, the entire group was in the same room, talking about this particular blend, and unanimously agreed that it was a winner. And agreed on its name. In honour of this rare 'meeting of the minds', their names were inscribed on the label for posterity. It was like that most of the night. Familiar faces, some who greeted me like an old friend, chatting me up about the latest harvest, new products on the go, plans for the summer. They ribbed each other in between pours, but you could sense the respect they had for one another, a familial bond forged by long days in the vineyards, longer nights sorting and pressing and testing. By the time the last of the bottles were being packed up for the night, I just wanted to throw my arms around all of them and say, "I LOVE YOU GUYS!" One thing I would really like to see at these events is a space for local wineries, like Domaine Perrault, Blue Gypsy and Jabulani. Yeah, they aren't VQA, but they make some pretty amazing stuff and deserve the chance to showcase their wares to a larger audience. And it would be another great way to get more people to fall in love with Ontario wines. Jackson Triggs 2009 Entourage Grand Reserve Sparkling Sauvignon Blanc - First thing that came to mind was Del Monte canned pears, and while that doesn't exactly sound complimentary, I assure you, I love that stuff. The juicy pear carried right through from start to finish in this off-dry sparkler. Peninsula Ridge 2010 Private Reserve Sauvignon Blanc - Winemaker Jamie Evans' take on fumé blanc, fermented in stainless steel and aged in old oak barrels. What is usually a tart, zesty grape was softened and mellowed, with rounded aromas of grapefruit, peach, pineapple and butter, a silky feel and medium weight. The Foreign Affair 2009 Abbraccio Sauvignon Blanc - Italian for "embrace", this was another atypical s.blanc. The partially dried fruit gave it an almost late-harvest palette of honey, apricot, smoke and creamy caramel. Nutmeg, ginger and preserved lemon hang around on the long, smoky finish. Vineland 2011 Gewurztraminer - The palest tinge of pink caught my eye, but it was the nose that left me weak in the knees. I was immediately transported back to the greenhouse of my mother's favourite flower shop, where, as a child, I would wander the aisles and breathe in the heady scent of roses in full bloom. Back to the glass: silky mouthfeel and wonderful bunches of tropical fruit flavours leading into a long, luxurious finish. Norman Hardie 2011 County Unfiltered Pinot Noir - As I said to Norm, this wine is the definition of terroir. Anyone who disputes the concept hasn't tried Norm's pinot. Dusty, vegetal, earthy, with a subtle touch of raspberry. I smell this, and I am so *there*. Foreign Affair 2009 Meeting of the Minds - Partially dried (30 per cent) Cabernet sauvignon and merlot grapes yielded rich and peppery aromas, and an intense and brooding feel, with dark cherry essence throughout. Peller Estates 2010 Private Reserve Meritage - Bordeaux blend that spent 17 months on French and American oak. Big, hefty nose of smoked meat, cherries and tobacco, followed by a silky texture and smooth tannins that grip right at the end of a spicy finish.